← Hello, World! We are Mighty Pocket. 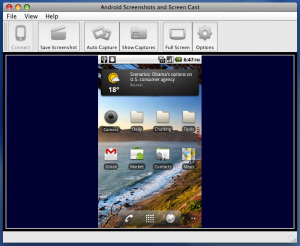 Android Screenshots and Screen Capture, code-name Ashot, is dedicated to capture screen of Android phone without rooting a handset. However, you will need to have a phone connected to a desktop/laptop via USB port. In such a way it can be used for full screen presentations, automatic screen capture, and screenshot transformations such as scaling and rotating. To install application please visit installation instructions. As soon as you get Ashot up and running on your desktop or laptop, it automatically connects with Android device and starts showing exactly what you see on your mobile screen. …and even shown in a full screen mode which is our favorite for demos and presentations. After you had played enough, let Ashot fulfill its purpose. 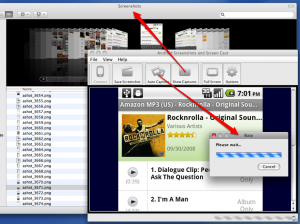 You can save a single screenshot with a click of a button on the toolbar or in the main menu. Or you may start automatic Screen Capture in specified folder. All screen changes of Android display will get saved to that folder. Enjoy our Mighty Tool and let us hear back what you think about it. The tool is available for download at SourceForge Android Screenshot and Screen Capture page. This entry was posted in Products and tagged android, products. Bookmark the permalink. I am not able to download the source from Sourceforge… . BTW I really like the application! Jan, sorry for missing source. We feel like the code needs some refactoring before we release it to the community. In a couple of weeks it will be out there, after we publish our primary app to the market. And thank you for the feedback! It’s the best kind of appreciation. Serg, thanks for sending a feedback. We’ve heard the similar problem from people who started “ashot.jar” from inside zip archive. In other words without unpacking the archive. Could you please provide more details on steps to reproduce? BTW, if you are on Windows you may want to try the new Windows Installer. Ali, if installer doesn’t work for you, you may need to install the tool manually from the zip archive. You may also want to have a look at Installation instructions. Thanks. Thanks for quick feedback, I really appreciate that. You might be right about Java version. Please try jdk 1.6. I am very interested in capturing screencasts of mobile devices. Do you have some examples of already captured videos with this tool? Thanks for your interest. Unfortunately, I don’t have any video recording from Android device to share with you. One of the reasons is that frame rate offered by the platform is very low (something around 1 frame per second). That said I would suggest making screenshots in Screen Capture mode offered by the Android Screen Capture tool (Ashot) and then make a video out of those screenshots. Ashot is good at making screenshots only if screen has changed. BTW I am going to shoot a new video of Mighty Grocery in a couple of days, and will make Ashot video recording for you as well. Please let me know if there anything else I can help you with. 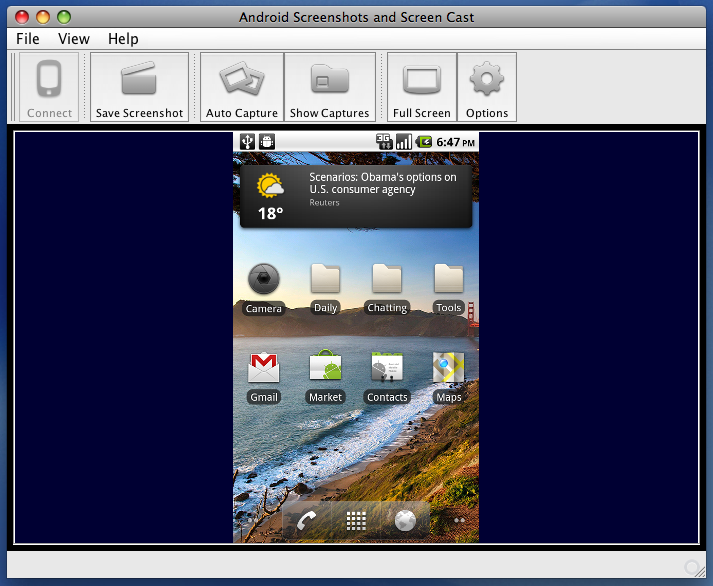 As I promised, here is the video of Android Screenshots and Screen Capture tool used for screen casting an Android application. Thanks for you interest in our tool. Assuming that you have SDK path configured correctly, could you please confirm your pc can grab your phone screen by standard means. Launch ddms (from SDK/tools/ folder). There should be your device in the list. Click on the device, and then from Device menu choose “Screen Capture”. The only obstacle for Ashot to see the screen of your phone I can think of is Turning on USB Storage. Though Nexus One will display phone screen in any case, it might be the difference in firmware. So please try connecting your phone so that SD card is inaccessible to your pc. Also please make sure you have Java 1.6 configured for your Mac by default (in Terminal — java -version). With recent Java update from Apple, my settings were silently changed back to Java 1.5 so I had to reconfigure it manually to 1.6. Though Ashot won’t start at all with Java 1.5, so I am pretty sure you are running Java 1.6. For the record, I am running previous Mac OS, Leopard. Could you please try the standard ddms (from SDK/tools/ folder) to take a screenshot? Hopefully it will work, and we will find out how to fix this in ashot. The other suspect is incorrect SDK path. Unfortunately, there is no check if the path is correct at the moment, though we are going to add this soon. Please try execute “adb devices” from $android_sdk$/tools folder. It should list all connected devices. If it doesn’t it means your device is not supported by drivers or your drives haven’t been installed properly. You can check it in Hardware manager. You should have “Android Composite ADB Interface” under the “Android Phone” item. Otherwise you can run AShot application from the command line “java -jar AShot-1.0.jar” and check the output. It would be great if you share the output of “adb devices” and “java -jar AShot-1.0.jar” with us. Just tried the standard ddms, and that worked and I was able to get a sceen shot. But it’s still not connecting in ashot. John, just to double-check — do you have SDK installed in “C:\android\android-sdk-windows” folder and you have *exactly* the same value in ashot’s Edit –> Options –> Setup path to Android SDK? It would be nice if you could run application from the command line and check the output as explained above by etf. I know, that sounds kinda geeky, so we want to push an update to have access to logs from application UI. John, thank you for the great news! I am sorry for inconvenience with SDK path. Will be adding SDK path check to prevent this in the future. Peter notified by email that ashot started working for him. But the reason why ashot did not work remains unknown. Kinda mystery. I installed your program for my Android 1.5 phone and when I started it up, it gave me a box to navigate to a location on my PC. So I went to the location of my Android phone (which was connected via USB) and your program said “Location of Android SDK invalid”. If I close the box, the app just shuts down. Mark, thank you for giving the tool a try. I guess the path you’ve entered does not contain Android SDK which is required to run the Android Screenshots tool. You may want to have a look at installation instructions and check section “2. Android SDK”. Per that section, if you have installed SDK in “C:\android” folder, the SDK path will look like “C:\android\android-sdk-windows”. hello, trying this tool for the first time and i put my phone into ” USB Debugging ” and when i open up the program it does not connect at all…. Nor in regular USB mode…? any clue what could be wrong? my USB drivers are properly installed and i also have SDK installed. Could you please confirm you followed our Installation instructions and that standard ddms tool will work with your device? Hi Tom, thank you for your interest in our tool. I am sad to hear about your issues but you need to make ddms running in order to use our Android Screenshots and Screen Capture tool. I guess the best bet would be to start installing SDK from scratch and try to follow our Installation Guide. Tom, I ran into this too. To resolve it, I had to add the SDK path to my Windows system path. Right Click My Computer, Properties, Advanced Settings (left panel), Environment variables, Locate Path and edit it. I usually copy the whole thing to notepad which is easier to edit. At the end, add a semi-colon if none exists and add the path to the SDK. e.g. I can’t remember which one worked. Once saved, you should be able to run ddms.bat. Has anyone gotten it working on a Galaxy Tab? I’ve finally gotten DDMS working (requires a Samsung download into the SDK) but the Ashot is not doing anything. Buttons for Start and Save are gray. FYI I got mine working after reading about the new platform-tools dir. My tools dir still exists and I was running adb there, ashot not working. I copied the new files including adb.exe from platform-tools into tools (don’t know if that was necessary but I did), restarted adb and ddms in the new platform-tools dir, restarted ashot, and bingo. Hi Glen, thank you so much for sharing your solution with everyone. As a side note, it was enough to copy just adb.exe to platform-tools. Anyhow, I am glad you could make the tool work for you and thanks again for writing back. Once you do that, go to your Android SDK folder, the one listed above (platform-tools), and copy everything to the ‘tools’ folder, no need to replace anything, just merge em all in. Once you do that the program should launch without issue. Phillip, thank you very much for writing the comment. It seems not to work with the lastest gingerbread sdk. Oscar, thank you for your comment. Unfortunately, this is true. We had to add this ugly hack to our installation instructions. Sorry for inconvenience, hopefully this will get resolved with the new update. I also have the new gingerbread and had to move the same three files. I finally got it to connect but all I get is a black screen. What should I do next? Hi Caroline, could you please try if the standard ddms tool is capable of taking screenshots? If not, there is no way Ashot can do it either. It doesn’t work for me. I’m using MacOSX Snow Leopard 10.6.6. How can I do for that? but it kept showing me this message. XML verification failed for https://dl-ssl.google.com/android/repository/addons_list.xml. XML verification failed for https://dl-ssl.google.com/android/repository/repository.xml. Hi Roz, thank you for your question. Kindly note that issue seems to be in Android SDK install, which is out of our control. I would recommend reading posts like this and/or google on the subject. Hmm still didn’t work for me. But thanks for your reply anyway. Ok – this is a really important pice of information. One _must_ copy (or symlink) the adb from platform-tools to tools. On a side note – why doesn’t it look for adb in both places? Good question. I hope it will do it eventually. It is complex to download, install, run & configure. Especially if its official lappy, it’s tough. But your efforts are Amazing…The thought, the program, the support, that to everything free is highly appreciatable….. I will look forward to see new apps from you! Thank you so much, Sarath! It’s a pleasure to be helpful and create convenient tools. first of all thanks of the tool ..
i need your help to modify according to our need, i downloaded the code also. Hello Sravanth, thank you for your question. If you would like to customize Ashot to your needs, I would recommend using NetBeans as development environment. Please pay attention to error messages, they may be helpful to compile the project. I’ve tried all the tricks above, but I cannot make ashot work with my HTC Desire HD. ddms works though. Can this problem be related to the HTC driver? In device manager, it shows up under “Android USB Devices” as “My HTC”, not Android Composite ADB Interface, as soon as the detect process is finished. Tried 3 computers, win7 and XP, same result. Kindly note that as soon as ddms can successfully connect and capture screenshots of your phone, it means that USB driver is fine. Could you please confirm that you have copied adb.exe, AdbWinApi.dll, and AdbWinUsbApi.dll, from platform-tools to tools folder? Thanks for the app. Works well on my Win 7 laptop. For those who have problem, make sure adb can list your devices and also make sure that you copy adb.exe, AdbWinApi.dll, and AdbWinUsbApi.dll into the Android SDK tools folder, as noted in the installation. If there is any improvement to be made, it would be the screen refresh rate. would give me the code of this app??? Hi Reynald, thank you for your interest. Kindly note that the source code is available for download from Ashot’s Develop page at SourceForge. I had the application and ddms working flawlessly with my Epic 4G until today when I updated the tool set. BTW: I had to re-copy adb.exe and the 2 .dll files from the “platform-tools” folder back to the “tools” folder after the update. Do you think could be an issue with the SDK, your application and/or the Samsung drivers? Any suggestions? I’m an idiot! I solved this issue during my initial setup of AShot months ago, but just realized I was repeating the same problem as back then. Solution: Do not use a laptop dock USB port, but rather use a USB port directly on the laptop itself. I am glad that you could resolve the issue. And thank you so much for sharing your solution with everyone! I think your program is great for presentations but I do have a little problem, because the caputered pictures I take are all in red. I think it could be a problem with android 2.3.3 that is running on the handheld ? Hi Thomas, thank you so much for your feedback. 1. What device are you using? 2. Will ddms tool make the same red screen shot? the device is the Sony Erricson Xperia neo and yes DDMs makes the same red screenshots. 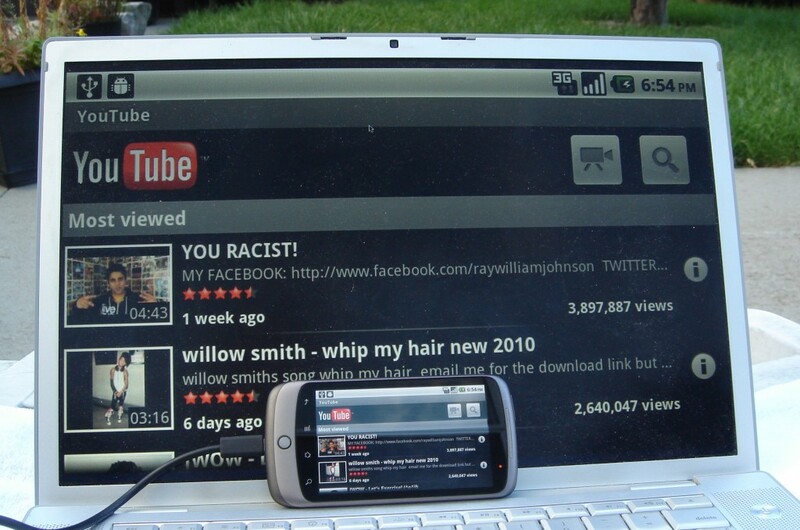 Me again, I just wanted to tell you that I tried it with a HTC Wildfire (Android 2.1) and it worked fine. Hi Thomas, thanks for providing additional details. Apparently, this problem has something to do with the hardware and/or system software of the phone. Hopefully, manufacturer will come up with the solution eventually. I am running Ashot manually after downloading and unzipping AndroidScreenCapture-1.1.zip. But I am unable to capture (nothing is displayed). There is an indicator in the bottom right that indicates that I’am connected. Below is what my log file looks like. Could you please help me find out what I am doing wrong? I have a problem about the screen capture. I used android SDK ddms.bat to capture, but it always all in red. My device is sony ericsson ARC and ARC version is android 2.3.2 . Unfortunately, this is a known issue of Sony Ericsson Arc compatibility with ddms.bat. Unless ddms.bat makes correct screenshots, Ashot won’t be able to make them either. But Ashot can not connect to my ARC. The “connect to handset” can not used. I have already copy the adb.exe from “platform-tools” to “tool”. I have already try Ashot success, it have the same problem like you said. So, this problem need sony release new firmware to solve this problem, right? Do you think sony know this problem? Good to know you could launch Ashot. As to the problem, unfortunately we can only guess what causes it. Hopefully, it will get resolved over time. Great work! Finally got it to work on my Thunderbolt. Win7 wasn’t recognizing the driver AND ASHOT wouldn’t recognize the device (it wasn’t showing up…I think this was because the driver issue). Tried all you tricks and tips and nothing still…then I downloaded HTC Sync (maybe the driver was in there, I don’t know) but viola! Once i did that I was good to go. Great job everyone…looks amazing. TJ, thanks so much for your feedback and sharing your solution with everyone. I am prompted to let Windows find the Program or I can; I choose Selelct a Prgraom, Browse to I browse to the Program Files\Java\jdk 1.6.0_24\bin and have selected java.exe and severla other and the install fails. I can connect to the device with ADK, do screen caps, etc. I have added the items listed above to the Env paths, copied the adb and dll files to the Tool directory, etc, but Ashot still won’t install.. Any suggestions? Please have a look at this comment where a nice person shares their experience of making install.jar to work. after opening ddms and screen capture, i get “unable to get frame buffer: timeout” at command prompt. Hi Roy, have you followed all the recommendations in Installation Instructions? I would recommend double-checking that device driver is installed properly. double checked and reinstalled. still same. now getting “E/EventLogParser: uknown tag number ” at command prompt when running application. Roy, unfortunately, we are unaware of the solution for your issue. As a general recommendation, the first step would be to install Android SDK and make sure ddms works. Once ddms can make screenshots, Ashot should be able to do it too. 1) You have no support on sf.net. Hi Scott, thank you for your feedback. 1) We offer support in comments section of this site. 2) You may need to extract application from zip archive manually if installer won’t work for you. I can’t get the ashot software to install. Does it work on vista 64. I can do regular screenshots through ddms.bat no problem. Hi Kirk. Have you followed the installation instructions? What are the steps you take to install the software and is there any error message? Thanks. I have installed JDK 1.7 and added its path in both user and system variables. However, when I try to install the Android SDK, I get the message that Java JDK is not found. There is not option in the installer window to point Android to the path, and I’ve added the path to the environment variables, what else can I do? I’m running windows xp SP3. I fixed it. On another forum, I read that when the “can’t find” message comes up, simply click “back”, then “next” again and it will find it. Stupid, but it worked. Hi from Spain, guys! I’m trying Android Screen Capture for my personal blog and I can’t find the AutoCapture function on Windows. Is it only available for Mac? Anyway, your program works perfect and if you need help to translate it into spanish I can help you. Thanks! Hi, there. The Auto Capture feature is available for Windows too. Please try File –> Start capture. Thanks for you offer to translate to Spanish. We may consider this going forward. Great Job. I was using with Android SDK 7. I moved to SDK 12 and now adb is moved from “tools” to “platform-tools” and thus while troubleshooting, I ran “java -jar ashot.jar” and get “cannot run android-sdk\tools\adb” I think this is the problem. Hi Dan, thanks for your feedback. Have you tried copying adb.exe, AdbWinApi.dll, and AdbWinUsbApi.dll, from platform-tools to tools folder as suggested in Installation instructions? This is an awesome app. I can really use it for my school.. I only have one problem. The first time I started it, it was working great. One day later I tried to start Ashot again, but it didn’t connect. I tried many things and I turn my phone on and off many times.. is there something I have to do before using it the second time? I already tried to First connect the phone and then start the app and vise versa, but it didn’t work? On my phone I selected ‘Use as a diskdrive’ and it worked good the first time. Hi there. There is nothing special you should do to use Ashot the second time. Please make sure that your phone has “USB Debugging” option enabled and all steps in Installation instructions are followed. Also, I believe you should NOT use “as diskdrive” option. Is there any way of improving the frame rate? i am trying to get games playing on my xperia play and the rate rate is just a bit to slow! even on 30fps, would this be down to the data transfer via the USB cable?! do you know of any way to improve this? or are there any plans to up the frame rate? HI Jamie, unfortunately there is no way to improve frame rate through USB. It’s current limitation of Android platform. Hopefully, this will change in the future. Best regards, Alex. Great app & great instructions – just enough to get me up and running. I’m also impressed by your support and feedback to users here. One quick question – the “screen changes” are captured and stored, but what do you recommend for turning that into a true “movie”? Hi DT, thank you for your feedback. Unfortunately, the frame rate provided by Android devices is low. It does not allow creating a good video using USB connection. The only working solution as of the moment is using external camera to record phone’s screen. I finally figured out how to make this work on my Mac so I’m gonna share this with you today. 2. Go to Android SDK ➞ platform-tools ➞ adb, then copy-paste this file in Android SDK ➞ tools…… you should have 2 copies of this file now! 3. Enable debugging mode on your phone and connect it to your Mac with the USB cable. When the application asks to select a path for the Android SDK, simply select the path where you’ve installed your Android SDK folder. The adb file will be erased from the tools folder if you upgrade your Android SDK. Simply follow the steps above and you’ll be good to go once again. Just tried this a few minutes ago and it worked. You can ignore my previous comment (no need to post). I finally figured out that the “text-less” window was looking for a path to the Android SDK. I supplied it and things are working now. This works on my XP machine but will not install on Win 7, 64 bit. Installation locks with a spinning indicator during the installation process. Is there a Win 7 compatible version? Hi there, thanks for your question. If there are any issues with running the installer, you may want to try unzipping Ashot files from archive available from Source Forge download page. Thanks! Hey I was just wondering before I download this, can I control my G1 In any way or does it just display what’s on my phone? Hi Zach, thanks for your question. The tool only allows showing your phone’s screen at your desktop. No ability to control your phone. Cheers! Thanks, so by any chance do you know of a program that does allow me to control it from my PC? Unfortunately, no recommendations. Google search might be helpful. Nice program as I was looking for something to do precisely this. One question though. Is it possible for show the screen for multiple (e.g two) Android devices onscreen at once? It would be great for showing network traffic and seeing how an action on one phone affects the second phone. Hi Josh, thanks for your feedback. Unfortunately, the tool can display only one phone screen at a time. Perhaps in the future we may allow starting a few instances of the tool so that each of them could connect with different phones attached to a computer. Cheers! I have a minor problem, though: I’m running on Windows XP and my App is fixed to running in landscape mode (android:screenOrientation=”landscape” in AndroidManifest.xml). On my device – Samsung Galaxy Tab – this displays nicely in landscape and with the 4 “buttons” to the right. In ashot, though, the display is upside down. Am I the only one with this problem? And/or how to fix it? Hi Soren, could you please let me know what is the result of ddms tool? Is it upside down as well? Can’t capture the screen of my HTC Desire S.
I also tried to run ddm and capture a screenshot, but my device isn’t listed there. Have you tried following Installation instructions? If I connect my smartphone Android to my laptop, will I be able to freestreem videos and still websites to my PC from my Android which is grabbing the web via its broadband web browser in the phone ? Is it legal or acceptable to my phone carrier if I use my cell phone as a internet source to my PC ? Hi Chuck, thanks for your question. Unfortunately, I don’t think that you’ll be satisfied with the frame rate you’ll be getting from Android phone on your laptop. This is the current limitation of the device. Therefore I doubt there going to be any legal issues. Cheers! It is possible to run this application on Linux? I’m using Ubuntu 11.10 and have tried to run the jar, it opens, but do not detect the device. I’ve tested the screenshot by using ddms, and it works. What I should do? Hi there, I guess you just need to copy adb from platform-tools to tools folder. Cheers! Yes! It worked, with the copy of adb. Thanks for the tip By the way, I liked this program very much, congratulations for the nice work! It will be helpful Cheers! I tried installing v1.1 but it did nothing when I clicked on Next. When I clicked on Next a second time, it hung. I’m running Windows 7 Home Premium 64 bit. The Android SDK and the Java SDK were installed previously, although not in their default directories. If Ashot installer does not work for you, you may need to intall the tool manually by unzipping the archive available at SourceForge. Cheers! I’ve read this entire comment thread and several other tutorials with no success. No one seems to agree with me that this is all VERY confusing and some things are being skipped. I have copied adb over to the tools folder. I have told Ashot the correct folder for SDK. I realize that I must be able to use DDMS before Ashot will work (however, that makes Ashot sound pointless, since all I want is to be able to take one screenshot). However, DDMS won’t let me connect to my handset and I don’t know why. In addition, everyone who has tried to be helpful and break down the Mac OS X process into four easy steps has forgotten what I think is one critical piece of information: by what method do you connect your phone to your computer?? Four options (PC Mode, Windows Media Sync, USB Mass Storage, Charge only) and no one has mentioned what it should be! 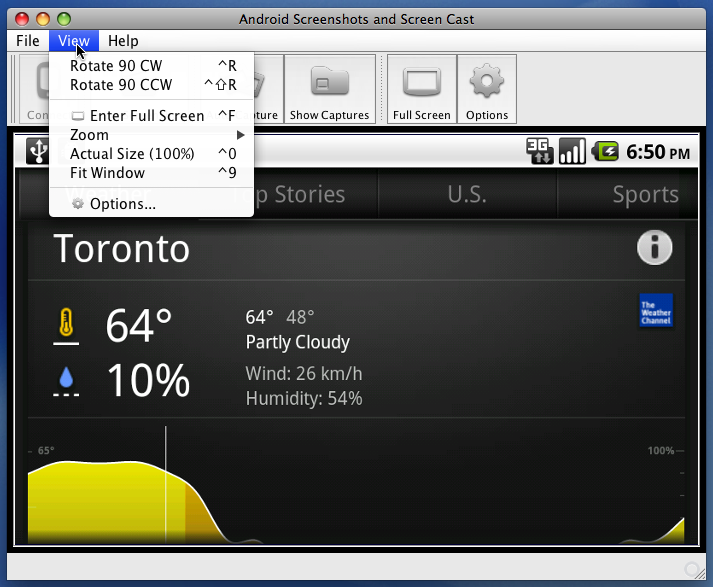 I seriously need a simple, yet thorough walkthrough for my Droid X on a Mac OS 10.7. And for the love of god, why doesn’t someone compile these individual tutorials into a nice, neat wiki so people don’t have to read hundreds of comments? Have you seen the Installation instructions? As the minimum, section 4 describes how you should set up your phone to get it connected with your computer. Installed the Android SDK, and run ddms.bat – ddms can find my phone. My phone is plugged in, set to ‘None’ (so my PC can’t find the SD Card) and is on USB debugging. Still, this does not seem to work. I’m on Android 2.2.2, and Windows 7. Hope you can help, and thanks for your time. Hi Dave, you might need to copy adb.exe, AdbWinApi.dll, and AdbWinUsbApi.dll, from platform-tools to tools folder as suggested in installation instructions. Cheers! Thank you so much! Again, thanks for your time. Just installed everything according to the install guide and everything is working great on Windows 7 with both my Asus Transformer and my Motorola Droid Razr. Thank you! I tried this program in the hopes that screen capture meant recording video. But all I can get the program to do is snap an image every second or so. I want to record video guides and tips and snapshots won’t work for me. Am I right that this program will not allow recording of video? Unfortunately, no. The frame rate is way too low for recording videos, and It’s the current limitation of the Android hardware. I have downloaded the app and it runs in my Mac, but the options for Save screenshot and Start Capture are grayed out. There is a “Disconnected” msg in the status bar, at the bottom. I am able to take screenshots with my Eclipse and DDMS perspective, as usual. Do I have to install anything on my phone? I have searched in the options of the app, but no way. What could I do to be able to use your app? Pedro, you might need to copy adb file from platform-tools to tools folder. Cheers! Thanks, I had the same problem. That fixed it! Max, does ddms work for you after updating the SDK? Okay it did connect with ddms. After I moved the 3 files (adb.exe, AdbWinApi.dll, AdbWinUsbApi.dll) from platform-tools to tools folder it started working. I updated the sdk since I last used your app, that musta been what happened. Thanks for the response! First, thank you for this program. I was disappointed that I couldn’t use this to view what the camera sees. I wanted to use the phone to monitor a small, hard to see area. I see that people above asked about viewing videos and you said the frame rate is pretty bad over USB. Do you have any plans to add this feature, perhaps using different connectivity? Hi Bruno, you may need to install the app manually by unzipping the archive available on SourceForge. nice and good application it works on acer iconia tab a501 but is there a new version that follows the movement of the display of the device accurately? Thanks for the app. Thanks for your feedback. Unfortunately, the low frame rate is hardware limitation, and there’s nothing we can do on program’s side. It works perfectly on my Mac OSX 10.6, HTC Desire. Thanks for making this freely available. Hello and thanks for a great application. I run the program against an app that draws a continuous sine wave at my HTC desire S. As if it goes step by step. This is extremely slow on my computer (windows 7). So my question is whether there is any way I can speed up. Best regards. Tested /w Ubuntu 11.10 and my ARCHOS G9 10.1 internet tablet for the internets. I cannot get the Ashot installer .exe to complete. It begins extracting, and gets to about 72% before it disappears. It doesn’t hang or freeze, it just disappears and nothing happens. I can see my device’s screen in ddms.bat, so that component is working. I’ve installed the screen shot program and it doesn’t do anything when I launch it. I’ve got the SDK path correct and I can use the DDMS to get screen captures from my phone. It seems to be looking for adb in the wrong place. 1. You copied adb.exe, AdbWinApi.dll, and AdbWinUsbApi.dll, from platform-tools to tools folder. 2. Path to SDK is set as suggested in the Installation instructions. I followed all the instructions and ddms.bat indicated that my phone(Galaxy S2) is offline, meanwhile on Ashot my phone seems connected but screen’s black. Is this compatibility issue? Thanks and more power. Hi, the first thing you want to do is make ddms make screenshots. If it says that your phone is offline, Ashot won’t be able to connect with your phone. I absolutely love Ashot, and I use it to do live presentations. Since there is some lag (little, but still visible) in the screen cast, do you know if there is some tip or trick to make the capture quicker? Hi Joe, thanks for your feedback. Unfortunately, the frame rate provided by Ashot is the best possible by Android hardware. Hopefully, this will get improved in future models. Thanks! It worked for me .. I had downloaded the files from here and it worked .. Thanks for providing this helpful tool for capturing screens from android device. To my understanding, the purpose to use this tool is not just for capture, but also monitoring (=monitoring), but i met a problem while using this tool. When i keep running (just open this tool tool and do nothing), the tool will get connection lost within 15 minutes or so. As to my investigation, the ‘screencap’ process in android device increased a lot (upto 7,000+ ), so that the linux os freezes any attempt of adding capture action via adb (adbd process as the parent process of ‘screencap’ process), and stopped shell connection. Looking forwards to your kindly reply. You can change the display timeout of your DROID RAZR MAXX under Settings > Display > Screen Timeout. As for preventing the screen from timing out when connected to a power source or your computer via USB, please go to Settings > Applications > Development and put a check mark on Stay Awake. New Android version which is after 4.0 will face with this issue, because the new feature called screencap added by Google from then on. Thus, just as the previous linked ariticle addressed, plenty of zombie process (screencap process which has finished its work but remains its process id) would stop running your tool at a certain timing (about 15 min with my device). In conclusion, MonkeyRunner will actually use the screencap for 4.0+ android version with the risk of zombie processes, or framebuffer mechanism for 1.X and 2.X android version. You can have a try on any android 4.0+ device. I guess the same issue would happen. I have tested this app on my workstation, and it is working well (after all the hoops you have to jump through). 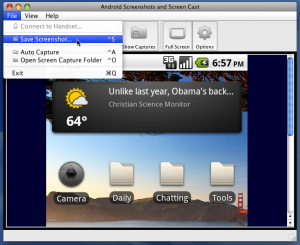 We want to install it in a lab so instructors can project an Android device’s screen for classes to see. However, the installation freezes up. The systems are both running Windows 7 64-bit, but are vastly different hardware. The system that it installed and runs fine on is a Core i7 quad 950 with 12 GB RAM. The system it will not install on is a Sempron 140 with 2 GB RAM. Is this just too old a CPU or too little RAM? Please help! Sean, try installing the tool manually. The zip package is available on SourceForge: http://sourceforge.net/projects/ashot/files/. just tried to install this in order to connect to a Samsung Galaxy S2 running ICS + Win7_32, but no luck. I also cannot find USB Debug Mode on ICS. I tried USB Mass Storage Mode, but no luck either. Any ideas? I’m sure I have followed the instructions correctly apart from debug mode. 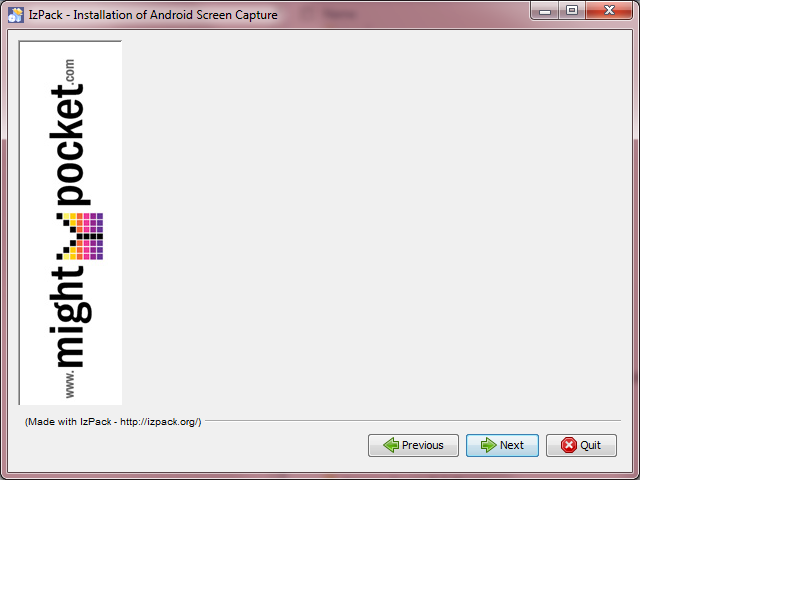 I did find the java app “Android Screencast” and I can display the screen using that just fine. Adrian, if you made DDMS work, then you may need to copy adb.exe, AdbWinApi.dll, and AdbWinUsbApi.dll, from platform-tools to tools folder. I got it to work on my MacBook–excellent! However, once I entered “Full Screen” mode, I can’t find my way back to non-full-screen mode (without rebooting or something similarly drastic). What is the top-secret handshake key combination? Jan, have you tried “Esc”? ESC doesn’t work. And [Command]-H turns the screen black, except that you can still see and move the mouse cursor. The only thing I found to work is [Command]-Q to quit the app. That’s better than rebooting, but not perfect. This is weird. Esc should exit Full Screen mode. Rebooting is the only suggestion that comes to my mind. Does Esc work for others? I can live with [Command]-Q, though. They moved a folder, so you need to move/copy adb.exe, AdbWinApi.dll, and AdbWinUsbApi.dll, from platform-tools to tools folder. I just want to say that this is a lovely tool. I have been looking for something like this for a while now. On my phone (Samsung Galaxy W) there is a small lag, but still is good enough. The app works after I created a symbolic link for the adb issue. ln -s ../platform-tools/adb adb (from the tools folder on my mac). Sven, try Cmd-E & Cmd-R shortcuts to rotate screen. Thanks for the application, it works great. Charles, thanks for your feedback! I have been instructing classes how to use to Android tablet in a work place (please imagine I am in a developing country. Most of people in my class have never used any tablet before) for awhile and just came across this tool. It is great! I am using this program on Windows 8 64bits on Lenovo Twist (using a windows installation). After following an instruction , it runs smoothly with no problem. I have tried it with Motorola RAZR maxx and Asus MEMO tab. They work perfectly. Hi! Love the app BUT when I capture it saves a ton of pictures, rather than a video! Any way to save a video file instead of a million pictures? Thanks! Erik, unfortunately video capturing through USB port is not feasible due to low frame rate. Sorry about that. Just use screencasting software like Screen-cast-o-matic and have it sit over top of this window. It won’t look very professional but it will capture what is there. You should label the first file chooser screen. I had to come back here to find out what it expected. Just call it “Browse to Android sdk directory” or something like that. Working now. The installer hung on me as well but it installed everything it just didn’t exit or install any shortcuts (if that’s what it’s supposed to do). Great tool. Thanks for your work. Kevin, thanks for your feedback. We are planning to fix that titile. I apologize for the inconvenience. This works even with Wireless ADB too, not only on USB. Just incase anyone might be interested. It is as good as (if not better) on Wireless ADB. Good point. Though your phone needs to be rooted in order to use Wireless ADB. I love this application was just wondering how often it capture images (not been able to work it out). If you are looking for an idea would be great if it could output the images in some form of editable document format in the correct order. Peter, thanks for the suggestion. 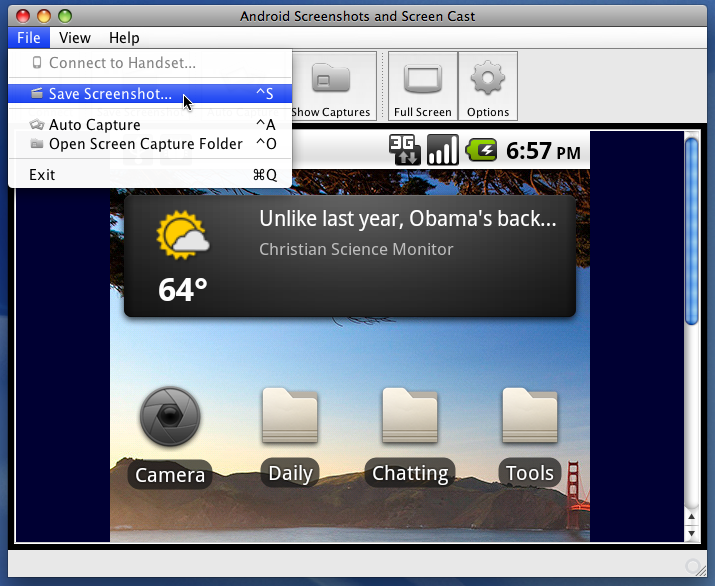 The app takes screenshots as often as your handset hardware allows it. As for saving screenshots in other formats, unfortunately we don’t have plans for that yet. Thanks again! Android SDK have to be installed on the computer. The messagebox on start-up does’nt inform about what it is searching for! Can be downloaded from Google. First of all, thank you so much for providing and maintaining this. I am having a similar issue to Peter and some other folks where DDMS works fine but AShot does not see my tablet (Asus Transformer Prime) as connected. I’m nearly certain the SDK path is correct as it’s the same exact path as the SDK path found in Eclipse. The SDK version I’m using is 4.2 and my OS is Snow Leopard. Any insights you could provide would be much appreciated. Thanks again! Okay – about seconds after I posted this I read the post where you wrote to copy adb from platform-tools to tools and now it works fine. Thanks! I have a Google Nexus 10 (2560 x 1600 pixels) and the lag between my action on the tablet and the computer screen is 7 seconds! 7 seconds is just too much. Is it the big resolution or do you know any optimization that can be done to the software to decrease the response time? Thank you in advance and thanks for a great software. Sergiu, unfortunately there is nothing we can do about this on the application side. It’s a hardware limitation and due to large screen resolution it becomes too visible. Works great on Motorola Xoom. No Android app that I tried would work at all, but I want to manipulate the images on my desktop PC anyway. I love it just the way it is. You may want to add some features in the future, but keep it simple! Just one problem, a file is created on my desktop: ashot.log. It kept growing until my C: drive ran out of space. I deleted the log file and got back 16 Gb. Is there a way I can suppress this logging? My workaround was to make the file hidden, read-only, so that the program no longer can write to it, but that’s not a very elegant solution. Chuck, thanks for your response. 16Gb — wow — that’s a lot of space for logs. Will see what we can do about it the next update. ..I’ve done everything correctly but I don’t know how to install Ashot..
Prateek, the jar file is sort of an exe file in Java world. If you have Java installed correctly, it should run without problems. Also, please make sure to follow installation instructions. One further issue, not serious but mildly annoying. After an hour or two of use, the program loses its connection to the device (Motorola Xoom). To reconnect, I go to the Settings (on the Xoom) and disable then re-enable USB debugging, which fixes the problem most of the time. If this doesn’t work, I have to restart the program or maybe even reboot. Now, this problem could be with my desktop machine, it’s an old clunker: 3GHz Pentium 4 running XP. Other than that, Having a Wonderful Time with ASHOT! Chuck, thanks for the response. Will see what we can do about it going forward. I am trying to take screenshots of my gt-i9100. Android version 4.0.4. Ashot doesn’t work for this phone. But it worked for some older Android phones already. USB debugging is allowed on this phone. Could you please tell me, what to do? Jakub, does ddms work for your new phone? thanks for quick reaction. I really appreciate that. Please just tell me how should I find that out? I mean whether ddms works for my phone or not. DDMS tells me that adb was moved and that’s why it can’t find the phone. What should I do? There was part in your manual which said we have to move adb and two another ones from platform tools into tools. So i tried simply to copy adb file and two others back. So now I have them in both tools and platform-tools file. Error message is gone but it cannot find the phone now. But ddms found the older phone. So it seems that it cannot find my Samsung GT-I9100. What should I do? Well, if ddms could connect with your older phone, but could not connect with the new one, there’s not much we can do. I’d recommend searching for solution online and make ddms connect with your phone. Once this is done, most likely Ashot will connect too. The problem was in USB drivers. I have downloaded PdaNet and drivers were repaired. But unfortunately this solution doesn’t work for all devices I need to test. Do you know where to find as biggest USB driver libraries as possible? I need to use Android Screen Capture on Samsung devices, HTC devices and so on. The best source for USD drivers are manufacturers’ web pages. I think I have solved the problem. For all of you guys. Try to download PdaNet app. It seems to be a great solution for finding the right drivers. It works for Samsung, HTC and so on. Thank you for this utility and for making it available. Much more convenient that regular DDMS screenshots when running a [live] demo for end users. The capture rate is extremely slow like 1 frame per second. Is it so or is there any options to increase it to match real time movement. Naren, unfortunately, the low frame rate is a hardware limitation. I am trying to use Android Screen Capture with Nexus 10 tablet. It works but it takes time to change the screens. Ashot is slowed down. But when I work with Android phone its fast. I was just wondering if you could tell me where the problem is. Thank you a lot and have a nice day. Jakub, the “problem” with Nexus 10 is that its resolution is huge and each screenshot takes significant time to transfer via USB. I expected that. Is there any chance to improve the speed? Using some special settings? Unfortunately, no. This is a hardware limitation. Rajat, thanks for your feedback! for who has the following problem: “Could not find the main class”. You have to launch the program with “java -jar AShot-1.1.jar”. I was having the later problem! All that was appearing was the android guy. Copying the ADB back to the tools folder made it work. It worked perfect for me, a little struggle instaling the application, but the .jar file saved the day! How can I increase the frame-rate? Unfortunately, this is a hardware limitation of Android handsets. i am very thankful to you for sharing this. i have gone through every steps but not able to capture phone screen. ddms.bat run successfully but assoc didn’t run. it shows as follow. Aswini, please enter path to Android SDK in the box from 2nd screenshot. Please see Installing Ashot for more details. thanks again for your support Alex. Hi… thanks for that amazing application… Im running with a Galaxy Tab 8.9″ and the screen`s orientation keep changing all the time (rotating)… I tried to remove all the movment sensors and fixed it as landscape or portrait, but nothing works… please help me!!! Vinicius, unfortunately, this sounds like a device-specific issue. Have you tried restarting your tablet and computer? I’ve followed the installation instructions. The ashot window opens but doesn’t seem to see my device. Any clues? Viktor, will ddms work for you? If yes, make sure that you enter correct path to Android SDK in the application. Viktor, when you start ashot it will ask you to provide path to SDK. Please have a look at sections #2 and #5 in Installation instructions. I’ve gone through everything again and it looks OK. But ashot doesn’t see my device (although ddms does). Can it have something to do with the fact that some files are in “C:\Program Files” and others in “C:\Program Files (x86)”? I have documented my system here. Hope that works. Viktor, where did you install SDK (#2 in Installation instructions)? What path did you enter in Ashot (#5 in installation instructions)? Viktor, try setting SDK folder in the application (File > Set Android SDK Folder) to one of the values you mentioned (C:\Program Files (x86)\Android\android-sdk and C:\Program Files (x86)\Dalvik\android-sdk). If this does not work, you may need to remove both folders and install SDK from scratch. I’ve (re-)loaded just about everything AND NOW IT WORKS! Thanks a million! I want to display digital signage in portrait mode on TV via an andriod device, I searched for many places and still could not find one, can anyone suggest ? I have being used this tool for a couple of years. It is working with my Galaxy Phones if the exception of the Galaxy S4. The device show as connected in the application but the screnn does not appear. Is there any clue regarding Galaxy S4? Ailton, are you using the latest Android SDK? I am wondering if you could help. First of all, I tried all available Android capturing software out there and Ashot is by far the one that yields the best results, so great work! I get some really smooth performance when I am capturing my Xperia X8 (Android 2.3, 320×480 screen) but a much choppier performance using my newer device, a Huawei Ascend (Android 4, 480×800). Is there maybe any setting that can be tweaked to improve the frame rate for my other device, do you think? Alex, unfortunately low frame rate is a hardware limitation. With larger screen the tool needs to transfer more data which decreases overall performance. Sorry about that. Works pretty well! Both for virtual device and hardware (tested on Galaxy S3). What is the capture rate so i can assemble my screencap to a video? Peach, unfortunately frame rate is a bit low for capturing video and it depends on your Android hardware. but it is not real time anough. how to increase frame rate? Unfortunately, there is no way to increase frame rate. It’s a hardware limitation. I’m trying to connect HTC Nexus One to my system (win7 64 bit) but its not showing handset. I have installed latest JDK. My SDK is also updated. From DDMS, I can see device connected. Only thing is your application doesn’t shown my device. Have you copied a few files as suggested in the Installation instructions?